WiFi is a funny thing. More like funny What the Hell! 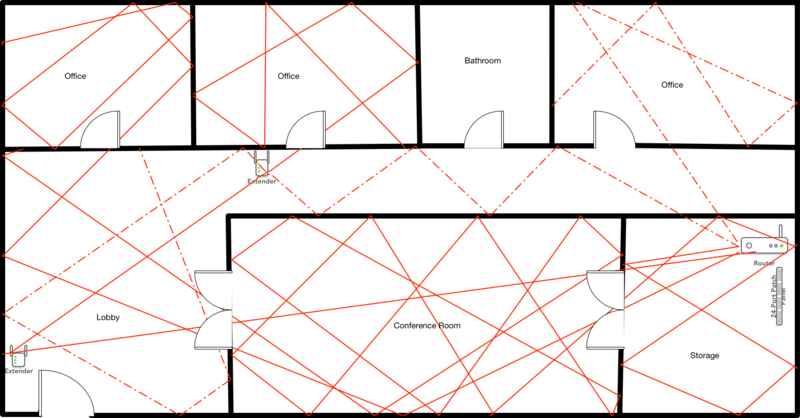 Most of us assume WiFi just goes right through walls, windows and floors without obstruction. A more realistic view of WiFi is to visualize your space with all the walls covered in mirrors and you’re trying to bounce a laser through it. Note the placement of the two Range Extenders or Repeaters in this example. Without actually testing the results you don’t know for sure, but this would be a good starting point. You may well need one in the conference room as well. The solid lines assume all doors are open and the signal is free to bounce from wall to wall. The dashed lines show the lower quality signal as it goes through the walls. As you can see, some areas get less signal than others as a result. So, if you want signal everywhere, sometimes you need range extenders. Or in today’s terminology, a MESH network. So what’s the difference between using a range extender or Mesh. Basically it’s this. With range extenders, each extender creates another WiFi signal with a different SSID. So you could have 2, 3 or 4 different WiFi networks in your space to connect to. That’s messy and creates interference (see list above). In the Harris household the router is configured to be HarrisWiFi and that’s what your laptop connect to. The range extender shows HarrisWiFi-EXT and you have to connect to that when you’re out of range of the main signal. With Mesh, each mesh device mimics your original network SSID, so you only see one WiFi network in your area and if you connect to it, the mesh keeps you connected as you travel from room to room. So in the example above, now you connect to HarrisWiFi at any point in the house. Much simpler. All this is not as simple as I have just made it out to be. As I said above, everything interferes with WiFi. The signal weakens with every wall, door or window the signal passes through. Most people think a range extender works by putting it in the room where they can’t get any signal. A range extender works in a room where it’s still got fairly decent signal. It can only re-transmit what it has to work with. So if it starts with a weak signal… That’s what it sends out. You didn’t solve your problem, you just made it a more expensive problem. Therefore, the first range extender goes at the edge of still acceptable signal. The second goes at the edge of good signal from the first and so on. The same goes for MESH. but then you only have one SSID to connect to. And that causes a lot less interference – and makes it easier for your devices to remain connected. All the years I’ve been installing home and small business networks and WiFi, I’ve found one brand to be the most reliable and that is Netgear. That’s what I personally use and what I install. Exclusively. Netgear does not compensate me for this. They should. But they don’t. These are the devices I like and use. For smaller environments this an excellent choice.